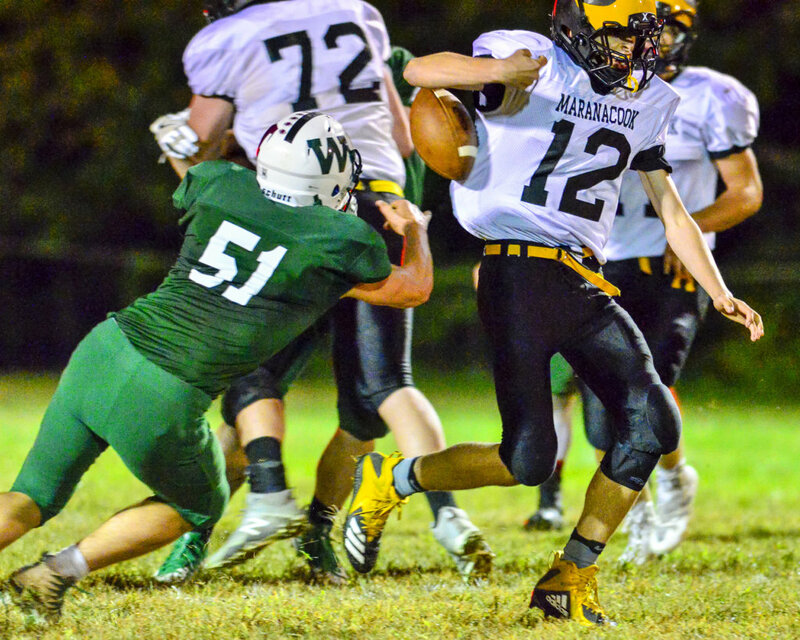 WINTHROP — With a game against Class E Maranacook sitting between a dramatic win over Poland and a marquee matchup with Class D power Lisbon, it would have been understandable if the Winthrop/Monmouth/Hall-Dale football team showed up Friday a little flat, a little sluggish, with its sights fixed elsewhere on the schedule. It took one play, and 12 seconds, for any such concerns to vanish. 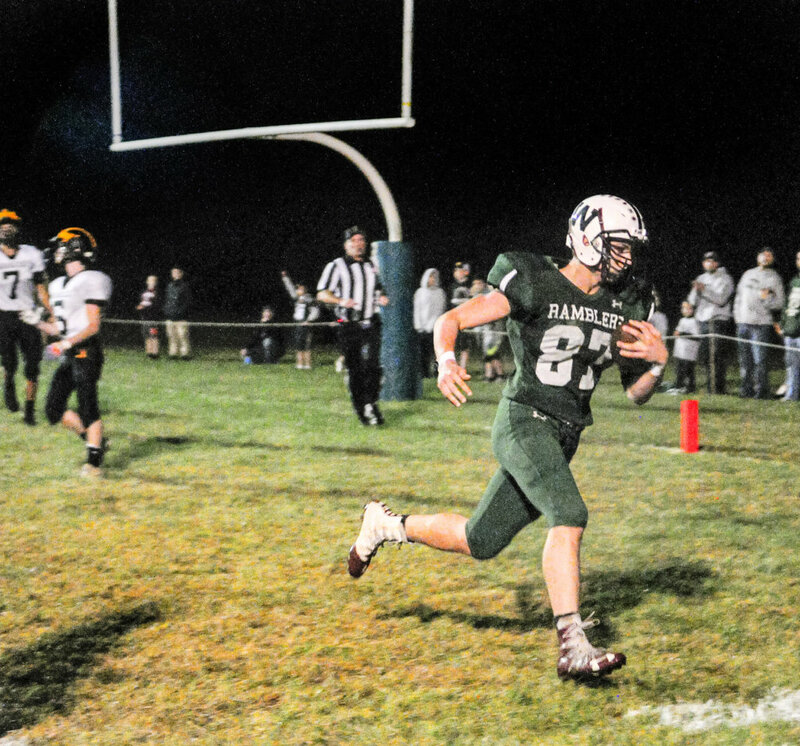 Beau Schmelzer took the opening kickoff back for a touchdown, and the Ramblers weren’t slowed much from there, coming away with a 37-7 win over Maranacook at Maxwell Field. Both teams are 3-2, but trending in different directions. The Black Bears have lost two straight, while the Ramblers have won two in a row and are over .500 for the first time this season. 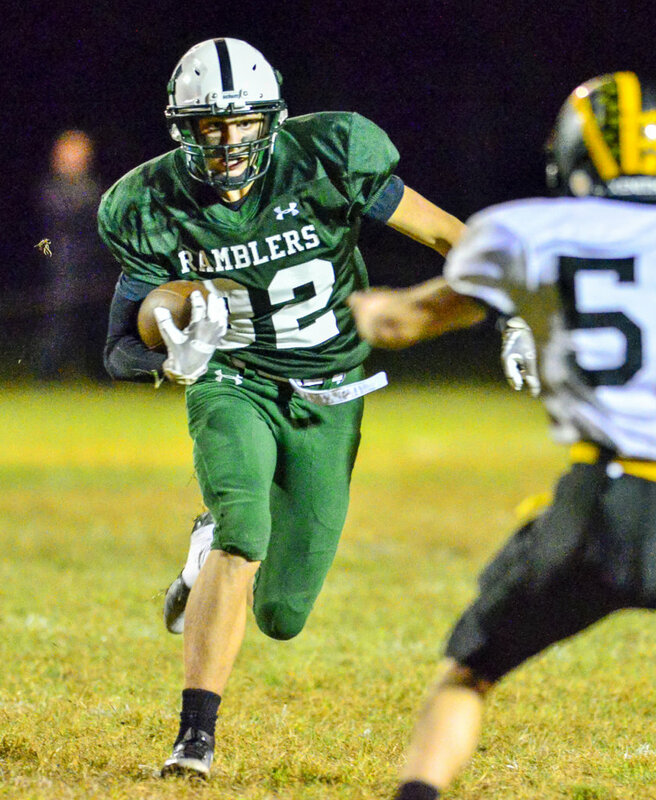 Schmelzer added a touchdown reception from Keegan Choate, who went 9-of-14 for 146 yards and two scores while also running six times for 24 yards. Ryan Baird caught four passes for 99 yards, Evan Burnell had three catches for 37 yards and a touchdown and Dylan Boynton ran 10 times for 60 yards and a score. 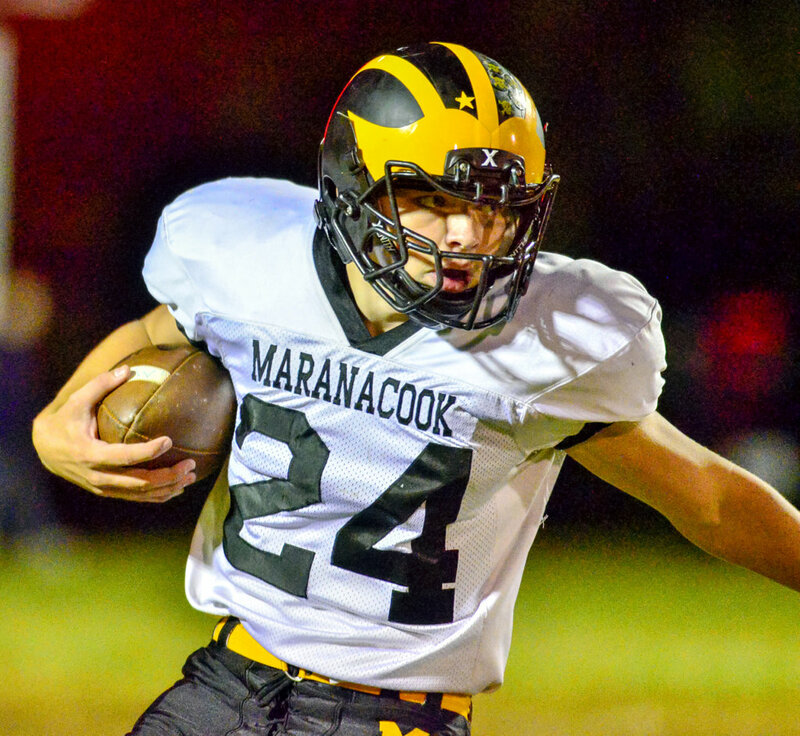 Maranacook got its touchdown on a long run by Dakota DeMott (nine carries, 67 yards), while Garit Laliberte caught five passes for 69 yards and Hunter Glowa completed seven of 12 passes for 87 yards. The Ramblers only needed seconds to strike. Schmelzer took the opening kickoff at the 16-yard line, turned upfield and saw gaping lanes through the Maranacook coverage. The junior speedster did the rest, racing untouched to the end zone for an 84-yard return and a 7-0 lead only 12 seconds in. 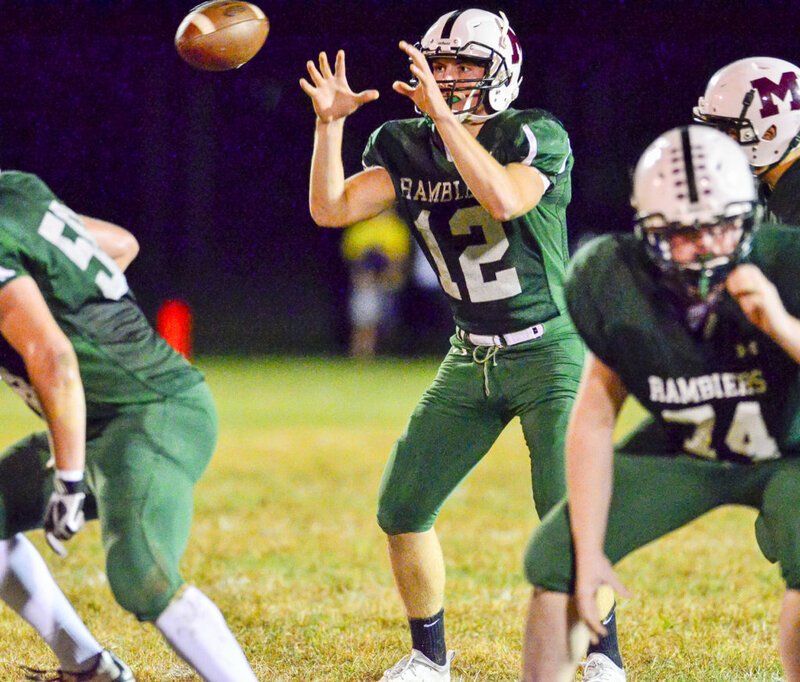 The Ramblers reached the red zone on their first series, but were denied after a fumbled snap on fourth down from the Maranacook 14. 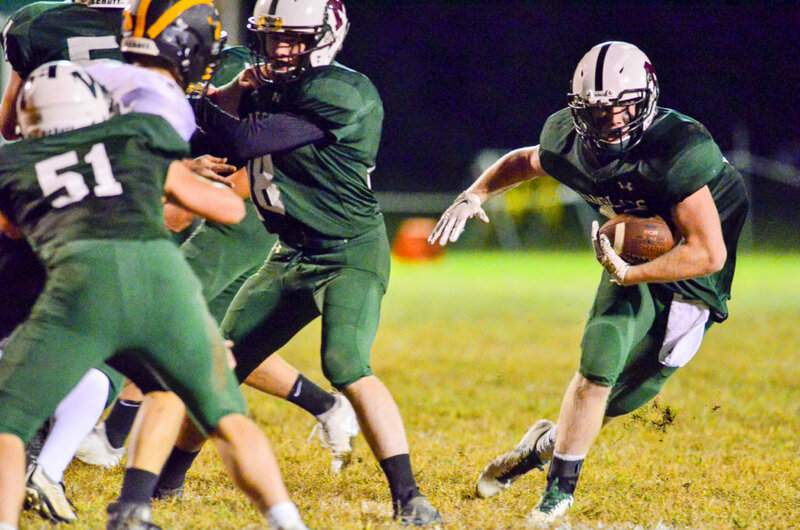 They finished the job on the next possession, however, getting first a 21-yard connection from Choate to Burnell on a corner route, and then a 9-yard hookup between the two for a touchdown with 10:40 left in the second quarter. The Ramblers had a short field for their next drive and scored on a 17-yard run by Boynton, making it 19-0 with 5:04 left in the half. Winthrop/Monmouth/Hall-Dale had a tougher task on the next series, however, and faced a third-and-12 from its own 12, but even then the Black Bears couldn’t make the stop. Choate hit Baird for 25 yards and then for 48 on back-to-back passes, and a penalty for a horse collar tackle moved the ball to the 7-yard line. Choate then found Schmelzer for his second touchdown pass of the game, upping the lead to 27-0 with 46 seconds left in the half. St. Hilaire said he liked the execution more in that second half, which saw an 8-yard touchdown run from Logan Baird on the first series and a 27-yard field goal from Ryan Baird on the second. 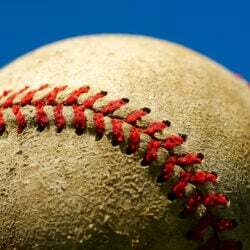 “First offensive series, first defensive series, we were more composed,” St. Hilaire said. DeMott broke free down the left sideline for a 64-yard score with 7:28 to go in the game.